Featuring Canadian icon Rick Hansen, Giants Among Us is the remarkable story of the legendarily long-lived White Sturgeon, as well as a timely celebration of Canada's sesquicentennial. On the breathtaking waters of British Columbia’s Fraser River, Hansen captains a crew of visionary Canadians working to save North America's largest freshwater species, majestic creatures which can live for up to 150 years. Against that timeline, Hansen plots key events in world and Canadian history, as well as more intimate, life-changing personal milestones. Drawing on footage from NASA’s archives, Hansen’s Man in Motion Tour, and Archives Canada, Giants Among Us underscores the astonishing longevity of the species, and the incredible transformations our planet has undergone in the lifespan of a single Sturgeon. 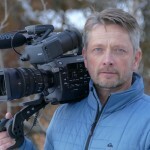 From a stand in on TV's Wiseguy to directing his first feature film The Plateau, (winner - best drama - Dreamspeakers Film Festival Edmonton) Robert Moberg has immersed himself in the many facets of independent filmmaking including acting, writing, directing and producing for almost two decades. His passion for wildlife conservation and environmental awareness demonstrated with the new feature documentary, Bighorns at the Junction. This very personal film, shot on location near Williams Lake, BC is being recognized for it’s engaging narrative and has been acquired by the CBC. To date, it has won best environmental film at the CAYMAN International film festival and has been selected for screening by many others including the Wildlife Conservation Film Festival in New York with a nomination for best cinematography by the Sunrise Film Festival in Nova Scotia. The feature documentary Giants Among Us - Rick Hansen and the Great White Sturgeon is currently in post production and tells the personal story of Rick Hansen's efforts to save the endangered White Sturgeon populations of the Fraser River.